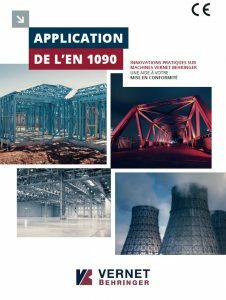 With the implementation of the new standard EN1090-2, structural steel fabricators have seen their profession evolve. Indeed, since 1 July 2014 they must ensure the compliance of their steel structures for the European market, with the requirements of the new standard-setting text in order to be able to apply the CE marking on their products. Eager to provide its Customers with the right contribution in its field of expertise, Vernet Behringer has identified and summarizes in this document (will soon be available in English) some important information for you and the impact on your workshop machinery.